The Quest Thrive hits the elusive sweet spot between quality and value. It’s a pleasant shooting bow offering more than adequate speed for hunting any North American big game animal. Here’s a news flash: Cutting edge, flagship bows are rarely the biggest sellers or highest income producers for bow makers. That honor goes to those bows that find the sweet spot between quality and price. It’s a small, constantly moving target, and near misses don’t count. 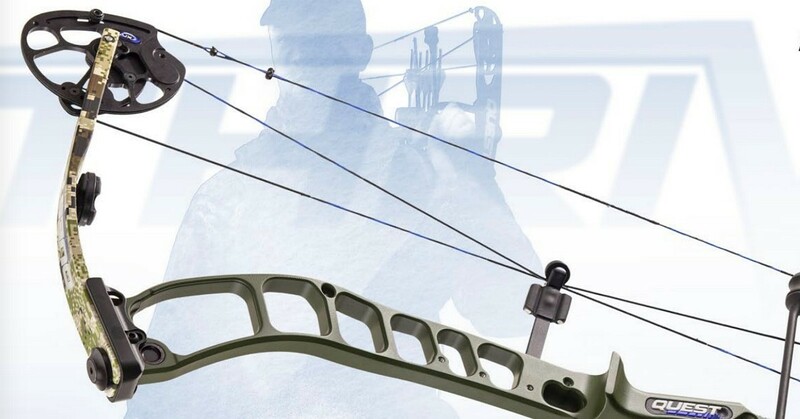 Of the two G5 bow companies (Prime being the other), Quest is the one that strives to produce good-quality bows at a moderate price — models such as the Quest Thrive. Regular readers of these Bow Reports know the tried-and-true method for increasing bow quality while keeping costs down: borrow better technology from a sister company or another existing line of higher-cost bows. The sister company in this case is Prime, and the Quest Thrive starts by borrowing the 82X riser material (and overall design) of the very successful Prime Rize. 82X is the strongest and lightest aluminum currently available, and is significantly stronger than the industry standard aircraft-grade aluminum. That means less flex at the shot, which means more stability for (theoretically, at least) enhanced accuracy. It also means less vibration and noise. Also borrowed from sister company Prime is the Flexis-AR cable guard system, a flexing roller guard design that is adjustable to offer optimum clearance for a given arrow/fletching combination. And though it’s not borrowed from Prime, the Thrive brings back one of Quest's better cam systems from recent years in the Flux, emphasizing smooth shootability over speed and offering adjustable limb stops. A Durafuse finish, 452X BCY strings, and Limb Saver limb dampeners are not new, but do contribute some additional high-end features to a bow that is all about value. In terms of appearance, there is nothing radically different about the Quest Thrive. It's a straightforward rig designed for bowhunting. The test model in Black showed no machining marks or other flaws, and was very durable, easily passing our scratch test. The top limb bolt was stiff and chattered initially, but soon smoothed out. The bottom limb bolt remained very stiff, and continued to stick and chatter when turned. Apart from that, set up was a straightforward affair. All standard accessories were installed without difficulty, and the recommended distance of 13⁄16 inches from riser to arrow center resulted in good arrow flight, requiring only minor tweaks to paper tune. If the test bow is an indication, the Thrive comes with a brass nock locator installed; depending upon which arrow you use, this might have to be adjusted or removed. Adjusting the cable guard is simple enough, and allows the shooter to adjust for the minimal clearance necessary for any given fletching. At 4.3 pounds, the Quest Thrive cannot be considered a light bow, but neither is 4.3 pounds inordinately heavy. The skinny, side-plate-style grip is very comfortable. The Thrive is, as the draw-force curve indicates, a very smooth-drawing bow. It drops off sharply into the valley and hits the wall abruptly, though not uncomfortably. A new-to-archery shooter will not be over-bowed. The adjustable limb stops ensure a rock-solid back wall. With 80 percent letoff, the Thrive is an easy, steady hold at full draw. At the shot, it jumps forward nicely into a properly loose grip, with virtually undetectable vibration. For technical reasons we needn’t go into, I’ve yet to test a bow that achieved its stated IBO speed, and that is allowing for the fact that we test with hunting weight arrows, as opposed to the lighter IBO standard 350-grain arrow. Some bows come closer than others, though. With a published speed of 328 fps, the Thrive is obviously not trying to achieve speed bow status. It’s fair to point out, though, that the Thrive comes significantly closer to its published speed than is the case for most bows. The real bottom line for any bow is the extent to which it lives up to a shooter’s expectations. Beyond the reasonable expectations that any bow be safe, reliable, and accurate, the expectations in the case of the Thrive are that it deliver a high degree of shootability (i.e. is smooth drawing, vibration-free and reasonably quiet), adequate speed for a hunting bow,and good value for the money. Ultimately shooters will decide for themselves whether or not a given bow hits that aforementioned elusive sweet spot between quality and value, but the Quest Thrive is, objectively and subjectively, a pleasant shooting bow offering more than adequate speed for hunting any North American big- or small-game animal. Go ahead and give it a go. You won't be disappointed. For more information, visit www.questbowhunting.com. Each bow is carefully inspected out of the box for fit and finish and for any visible defects in workmanship. Axle-to-axle length, brace height, mass weight and draw length are measured and compared with stated specs. Minor discrepancies in draw length are corrected or noted. A QAD UltraRest is installed, and each bow is equipped with a TruGlo sight, a TruGlo stabilizer, a G5.25-inch Metapeep and a D-loop. Test arrows are Carbon Express Maxima Red arrows at weights of 385 and 440 grains, fletched with Bohning Blazer vanes and fitted with QAD Tune-A-Nocks. Peak draw weight is established, and draw force curves, along with letoff, are determined using an Easton Bow Force Mapping System.